With the only leader Uzbekistan has ever known still in hospital, and the opposition speculating he might even be dead, the focus is firmly on Islam Karimov's successor. One week ago any debate would have been unthinkable. In authoritarian Uzbekistan, it would have been too risky to even acknowledge any health problems. But Mr Karimov's daughter Lola posted a message on Facebook saying he had suffered a brain haemorrhage. 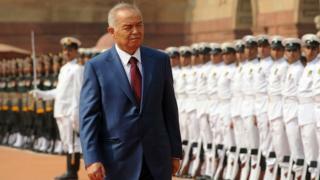 Now a nation of 31 million is facing the prospect of an Uzbekistan without President Karimov, and no named successor. In recent years any debate about the succession has inevitably been embroiled with the Karimov family's "dirty laundry". Until just a few years ago, many believed that Mr Karimov would be succeeded by his glamorous eldest daughter, the pop diva, fashion designer and businesswoman Gulnara Karimova. She was clearly being groomed as such and regarded as one of the most powerful people in the country. But her downfall was swift and brutal. In 2013, with allegations of corruption swirling, Ms Karimova's businesses were requisitioned, and her TV and radio channels shut down. She was also probed for corruption in cases involving hundreds of millions of dollars in Europe and US. She is now believed to be under house arrest. "Gulnara Karimova tried to go beyond what was permitted in the system," Dr Eric McGlinchey, associate professor at George Mason University says. "She tried to accumulate not just some of the economy, she tried to accumulate all of the economy. She didn't compromise, she didn't play by the rules." As Gulnara Karimova was losing power, she accused her younger sister Lola Tillayeva-Karimova and her mother of trying to get rid of her. Many analysts say this family feud reflected a deeper power struggle in the nation. Among those who Gulnara named as being behind her troubles are people who are now contenders for the job. One of them is Rustam Azimov, who is both deputy prime minister and finance minister. Mr Azimov was appointed minister back in 1998 and considered very close to Islam Karimov. Viewed as a more pro-Western voice he was the governor of the European Bank of Reconstruction and Development for Uzbekistan in the 1990s. Alisher Taksanov, an Uzbek journalist who lives in Switzerland argues that Mr Azimov has a good chance also because he is from the "Tashkent clan". "This clan has managed to seize all key positions in the country - interior ministry, security services, finance ministry, etc. This clan is more powerful than their rival 'Samarkand clan' headed by the Prime Minister Shavkat Mirziyoyev." Clans in central Asia are networks based on regional loyalties and these networks are used to accumulate power and wealth, so particularly influential at times of succession. But others believe that Mr Mirziyoyev who has served as prime minister since 2003 is more likely to succeed President Karimov. "If you look at who has more state resources, then Shavkat Mirziyoyev has better chances," says Kamoliddin Rabbimov, an Uzbek political analyst who used to work in the presidential administration before fleeing to France. "He has been at this job for 13 years and appointed his people to key positions all around the country," Mr Rabbimov argues. Most agree that the head of the security services Rustam Inoyatov, a former KGB spy, will be a power broker. Mr Inoyatov is also one of those accused by Ms Karimova to be behind the demise of her empire. But such intrigue imparts a powerful message about how a power transfer will happen in Uzbekistan. Whoever wants to succeed President Karimov must reach a compromise with the rest of the political elite, something Gulnara Karimova refused to do. "All things point to continuity, to someone who would be inclined to maintaining the kind of regime that Karimov created," Dr McGlinchey argues. "And the reason for that, if you look at Uzbekistan, all sources of wealth [there] come from the government. People who are wealthy in Uzbekistan will have a strong incentive to maintain the system that gave them the wealth in the first place." So the transition is largely expected to be quiet and hidden from the public and many expect the tone Mr Karimov has set, where dissent is not tolerated and any protest quashed, to continue. Indeed the successor may not necessarily be a well-known figure, analysts argue. "This may be a compromise candidate that all power brokers are comfortable with and as a result might not be the big three that we keep hearing about," Dr McGlinchey says. What is clear is that the new leadership will not try to change the authoritarian system in Uzbekistan. They will continue relying on repression and state propaganda to maintain their power, just as Mr Karimov has done for 27 years.